Traditionally, Taquerias prepare Al Pastor as thinly sliced marinated pork on a vertical spit, usually with a piece of pineapple on top. Most of us do not own a vertical spit, but a rotisserie can act as a substitute. For Al Pastor the most common pork cuts are either pork shoulder or pork loin (the latter being used in this pork tacos recipe). If you don’t have the skills and equipment to slice it thinly on our own, ask your butcher to do it. The pork meat has to be marinated, so while we prep the marinade, place the meat in a zip lock bag with 1 cup of white vinegar. Peel the skin off one medium sized tomato, slice it into smaller pieces and throw it in your food processor. Add 6 peeled garlic cloves, ½ white onion, 5 whole cloves. Boil the 3 dried Ancho and 3 guajillo chili peppers to soften them up, slice them open to remove seeds and place them into the food processor as well. Finally, add ⅓ Cup of the water you boiled the peppers in, 1 Tbsp cumin and a pinch of salt. Blend the ingredients together until the mix looks smooth and uniform. Drain the vinegar from the pork and add the marinade to the bag. Seal it and let it marinate in the fridge for 6 hours before cooking. When you get 5 hours into marinating (1 hour before cooking), add 1 Cup of pineapple juice. This has to be added at the end, since the enzymes in pineapple would have turned the meat mushy if left for the 6 full hours. When done marinating, remove the meat form the bag and secure it on the spit. Try to clamp the slices down as tightly as possible. Slice 3 pieces off the pineapple (lengthwise) and secure them around the meat using roasting twine. Use the same twine to better secure the meat on the rotisserie so it doesn’t flop around during cooking. Let the pork spin over direct heat for about 2 hours. The goal is to let the meat roast slow, and have just the right amount of charring at the 2 hour mark. When the meat is done, pull it off the heat. Slice off some meat and lay it down on 2 corn tortillas, add some of the roasted pineapple, and garnish with chopped coriander, minced onion,a squeeze of fresh lime and your favorite Mexican salsa. Wrap the taco up and enjoy! 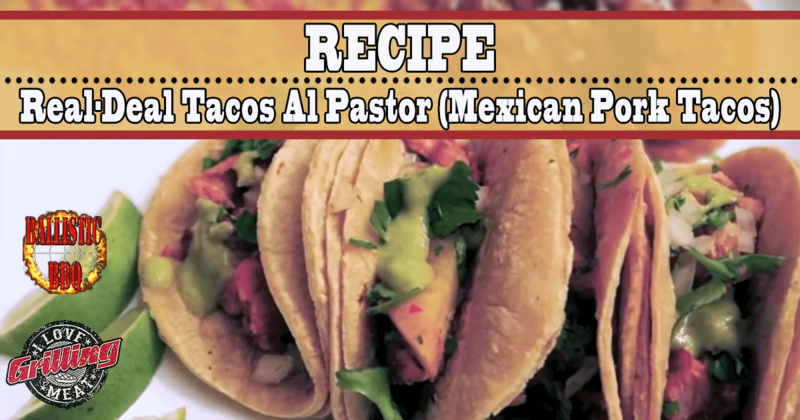 We hope you liked this pork tacos recipe, check out some more recipes by following the links below.